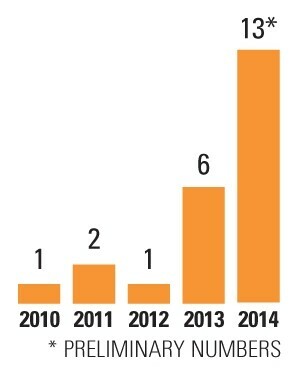 Reports of sexual violence at Cal Poly have skyrocketed since 2012. According to preliminary data from university law enforcement, police received 13 reports of sexual assaults on or around Cal Poly’s campus in 2014—that’s up from six in 2013, and just one in 2012. That’s the highest number of assault reports in at least a decade. This does not, however, mean that Mustangs are suddenly many times more likely to be assaulted, said university representatives and local sexual assault experts. Instead, the 2014 statistic may be closer to the reality than ever, following several years of on-campus work to reduce underreporting, and an ongoing nationwide conversation about sexual violence on college campuses. SEXUAL ASSAULT STATISTICS: The number of sexual assaults reported to Cal Poly has increased over the past five years. These numbers come from university police, and the crimes were reportedly committed either on or near campus. “I don’t think there’s an increase in sexual assaults; I think there’s an increase in reporting the assaults that already happen,” said Cal Poly Chief of Police George Hughes. University police compile crime statistics annually to comply with the Clery Act, which mandates that federally funded universities publish records of crimes that occur on and adjacent to campus, including in Greek houses. This, Hughes argued, is a testament to the outreach Cal Poly has done through its sexual violence resource center Safer. Safer offers crisis counseling for students affected by sexual violence, as well as presentations and training for the rest of the student body, reaching more than 10,000 students annually. “Sexual assault will always be an underreported crime, but with the excessive amount of outreach we have done, sexual assault victims are more willing to come forward,” Hughes said. Safer’s crisis counseling became confidential last fall following an executive order from the California State University Chancellor’s Office, which may also have contributed to rising numbers. In the past, Safer employees were required to report all instances of sexual assault to the school’s Title IX coordinator regardless of the survivor’s wishes. “More students feel comfortable coming in knowing that they don’t have to initiate an investigation, and once we tell them about their options, they can make a decision,” Safer Coordinator Christina Kaviani said. The number of students who sought crisis counseling quadrupled in the first year of confidential services, increasing to 208 in 2014, from 48 the previous year. That includes those affected by sexual assault, dating violence, or stalking, whether as friends of survivors or survivors themselves. The spike in assault reports at Cal Poly follows a national conversation on sexual violence both on and off college campuses, sparked in part by a 2014 White House task force to end sexual assault on college campuses. A president taking sexual assault seriously can be a powerful thing, said Jesse Torrey, associate director of Respect Inspire Support Empower (RISE), formerly the Sexual Assault Recovery and Prevention Center. “When national awareness grows to that level, it starts to allow a platform for change,” Torrey said. In fact, the increase in sexual assault reports was not limited to Cal Poly’s campus. The San Luis Obispo Police Department reported 47 rapes and attempted rapes in 2014. It was the city’s highest number in at least 30 years. Other areas of the county didn’t mirror these statistics, but Torrey said it’s still likely an increase in reporting thanks to national and local efforts rather than an increase in assaults. Despite the increasing reports, 13 sexual assaults at Cal Poly likely don’t tell the full story of sexual violence in the community. A 2007 Department of Justice study, as well as a 2014 Washington Post survey, found that 1 in 5 female students experience sexual assault while in college, and the vast majority of those assaults are never reported to law enforcement. Because of the widespread underreporting, Kaviani said she expects Cal Poly’s sexual assault numbers, both students seeking crisis counseling at Safer and assault reports in the campus crime statistics, to continue an upward trend as awareness continues to grow. Intern Anna Hoernell can be reached via editor Camillia Lanham at clanham@newtimesslo.com.